Button up to the collar shirts have been a fashionable statement for some time now, and this season we have also seen chiffon being a popular choice too. This chiffon button up shirt offers you a current trendy style with some added edginess; the cut-out shoulder design is a real statement feature to this garment which offers a maximum style impact for any girl! The design features gold buttons up to the collar which is a striking contrast teamed against the navy blue, the bodice offers extra coverage with an attached camisole whilst the sleeves and the neckline has a lovely sheer see-through effect that is super glam. The fit is quite loose so there is no need to worry about it clinging in any way. 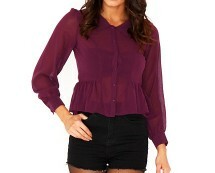 For the best results team this glam blouse with skinny denims or wet-look leggings and killer heels. Ideal for daywear or dressing up for glam nights out!